We all know we have to pay our bills to keep from incurring late fees or disruptions to our service. That being said, many of us wait until right before or the day of the due date. Although paying your bills on the due date gets the job done, you might not be aware of the added benefits of paying your bills early. Apart from the obvious, there’s an array of reasons promptly taking care of your bills pays off. Before your next round of bills, consider these six reasons to pay them as soon as they arrive. Whether you only pay the minimum interest, or don’t pay as soon as your credit card bill comes, you’re ultimately costing yourself more in the long run. Your interest is calculated depending on your accounts daily balance. Ergo, the higher that balance is, the higher your interest rate will be. By choosing to hold off or only pay the minimum, you’re allowing your credit card company to simply accumulate added interest on your account, which means you’ll pay a lot more as time goes on. Moreover, your credit card bill isn’t the only account this applies to. Your mortgage and car bills work the same way. Depending on the company and your location, paying your bills can also equate to some great discounts on your bills. In some cases, you can receive up to 10 percent in a discount on some of your utility bills or up to 3 percent on property taxes. Furthermore, if you pay your health care bills on time or in the full amount, you might also qualify for discounts on health care as well. Take the time to check with your government or providers to see if early payment qualifies you for discounts. Although paying your bills early doesn’t necessarily count towards lowering your credit score in the moment, it can serve to help you build credit in the long run. By paying early, you ensure that you pay the minimum amount each month, which ultimately helps you build your credit. Even better is if you pay more than the minimum amount, so that you don’t run the risk of accumulating interest to the point that you can’t pay your bill that could in turn, harm your credit. No matter how meticulous you are, mistakes and errors are simply part of life and bound to happen. Whether your online payment didn’t go through or takes up to three days, your check got lost, or there was a mishap with the bill itself, paying your bills on the due date doesn’t provide you with extra time should any of these things occur. And unfortunately, just because your check was lost or the payment didn’t go through, usually means you’ll still acquire late fees. 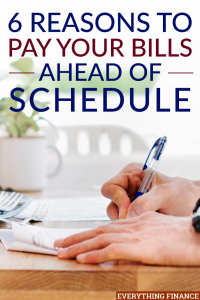 Give yourself some wiggle room by opting to pay your bills early; that way, should a mistake happen, you’ll still have plenty of time to fix it. If you’re like most people, your basic necessities and bills each month, aren’t the only expenses or purchases you’ll make. You likely have more fun or entertainment-based wants, like dinners out, a new outfit, or a concert ticket you’d love to purchase. On the other hand, you might also have random expenses arise that you weren’t exactly prepared for. That being said, it can be difficult and a little worrisome to spend extra money or use your credit card when your bills aren’t paid off. By paying your bills early, you’ll not only be free to do with the rest of your income what you please, but can clear up your credit line for other necessary purchases or expenses as well. You might even be more motivated to put the rest of your income into savings since you’ll have held off on buying extraneous items. This might be obvious to you, but one of the biggest benefits of paying your bills off early is that it’s simply less stressful. When you put off your bills the chances of you losing the bill, forgetting to pay it, or simply stressing over the fact that you have to ensure you have enough income to pay it, all creates more worry and stress on your part. Life tends to have enough stressors without adding more to it. By paying your bill ahead of time, you’ll get it out of the way and give yourself peace of mind from knowing it’s taken care of. Moreover, it reduces the stress of fearing potentially larger problems in the future, should something happen that causes a mishap or late fees. Assist yourself mentally, and simply pay your bill early. Let’s face it, no one likes paying bills. It’s one more item we have to spend money on and one more thing we have to do in our day. Unfortunately, whether we like it or not, our bills never go away. You have to pay your bills at some point if you want to keep living the way you do. You can wait until you receive your bill in the mail or until the last minute. But, you might find that getting ahead of the game is much more beneficial. In the past, you may not have had much of a choice to pay your bills early with some paper bills. However, in today’s digital world, with online bill pay and the ability to access your accounts electronically on a regular-basis, you can usually take care of bills early. From earning discounts to cutting your interest to simply causing yourself less stress, paying your bills early only serves to benefit you and your bank account. Help make your life easier and start the habit of paying your expenses off promptly. Do you try to pay your bills early? Have you found yourself reaping any of these benefits?